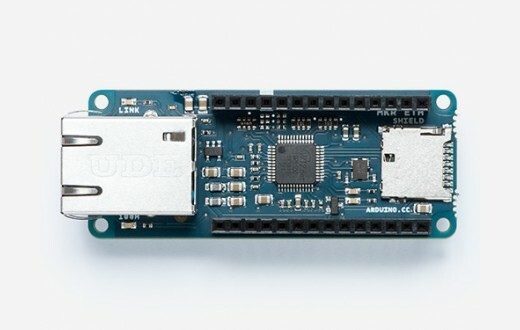 The Arduino MKR ETH shield allows a MKR board to connect to the internet using the Ethernet library and to read and write an SD card using the SD library. The chip used on this shield is the Wiznet W5500 and provides a network (IP) stack capable of both TCP and UDP. It supports up to eight simultaneous socket connections. As the W5500 and SD card share the SPI bus, only one at a time can be active. If you are using both peripherals in your program, this should be taken care of by the corresponding libraries. If you're not using one of the peripherals in your program, however, you'll need to explicitly deselect it. To do this with the SD card, set pin 4 as an output and write a high to it. For the W5500, set digital pin 5 as a high output. To learn how to use this shield in your projects, you may refer to the Ethernet library and SD library examples. This shield is compatible with the MKR family of Arduino boards. It is obvious that any MKR board that has an SD slot on board may conflict with the one on this shield.